I always considered walking around Manhattan to be a safe and healthy activity. After all, I did it on a more or less daily basis for close to a decade with nothing more than the occasional scrape due to my own clumsy feet. But when I started thinking about it, I realised that while millions of people traverse the streets of New York on a daily basis and most of them make it home to sleep safely in their beds each night, there are some risks. For example, there was the steam explosion in July 2007 outside of Grand Central Station. My train left the station just 2 minutes before the street outside exploded leaving a hole big enough for a truck to fall in it, one person dead apparently of heart failure, and around 20 injured. 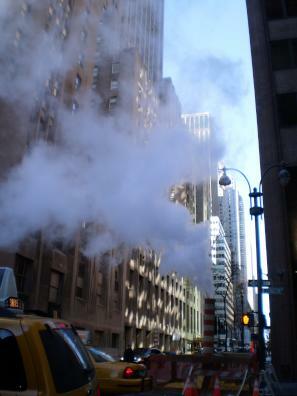 New York has the biggest steam system in the world with some 30 billion pounds of steam flowing under Manhattan each year according to Kate Ascher, author of The Works, Anatomy of a City, and when water condenses in a pipe it can sometimes lead to a 10 fold increase in pressure causing an explosion. The best known and deadliest occurred in 1989 near Gramercy Park – it killed two steam workers and a nearby resident. Then there was a spate of collapsing cranes in the first half of 2008 killing a number of workers, and one woman who was in town for the St. Patrick’s Day parade. The city has vowed to improve the permit system to ensure cranes comply with safety standards. Which is important when you consider that roughly 250 cranes are operating around the city on any given day. And not to forget the Russian roulette of electrified gratings. 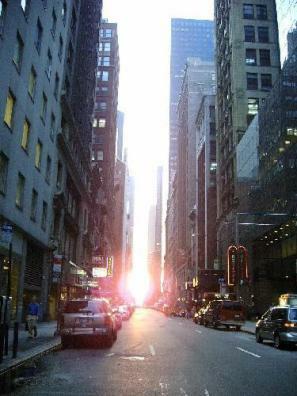 New York runs most of its electricity underground and sometimes sidewalk gratings and wet pavements become electrified. In 2004 a woman was electrocuted when trying to rescue her dog from one of these gratings, and subsequent testing by the electric company identified more than 1,400 sources of stray voltage around the city. When I attended an Emergency Response programme through my work in 2007 the NY firemen conducting the training said that if you stand on a grating and feel a tingling though the soles of your shoes, hop backwards off it. This way you remove the risk of having one foot on the grating and one on the pavement potentially creating a deadly circuit. Dogs have the highest casualty rate being close to the ground and often bare pawed but happily some doggy boutiques now offer rubber soled “hiking boots” for dogs to protect them from stray electricity. Another reason for avoiding grates is that they occasionally collapse. One woman on her way to work in May 2007 fell through a grate down 10 feet into a transformer vault, amazingly without serious injury. Along with avoiding walking on grates it pays to keep an eye on manhole covers. An occasional build up of gas that then comes into contact with an electrical spark has led to 250 pound covers flying as high as 50 feet in the air. The same firemen who told us about the grates said there are two things to do if a manhole cover blows near you. One is to keep an eye on it because if it goes up it will come down and you don’t want to be under it. The other is to run away as fast as you can because if one blows it can set off a series of others. The pavements themselves can also be a bit of a problem. If you hit a pothole while driving you can file a claim for car repairs with New York City for damage incurred. If you are walking however it is a little trickier. A friend of mine fell in a hole near Gramercy Park and needed surgery on her foot but the city argued the hole was the result of service repairs so the city didn’t own the hole. Historically the city accepted responsibility until Mayor Ed Koch decreed in 1974 that the city was not responsible unless it had prior written notice of the pothole. The New York State Trial Lawyers Association then formed the Big Apple Pothole Protective Committee and hired a mapping company to survey the sidewalks and crosswalks and send the information to the city to serve as prior written notice. In 2003 Mayor Michael Bloomberg took another step away from city liability by passing legislation that makes abutting landowners responsible for most of the holes. This site: www.stephanpeskin.com/PracticeAreas/Pothole-Sidewalk-Accident.asp has more details for those interested. The bottom line is watch where you are walking because compensation for pedestrian injury is hard to come by. And then there are the things that are just plain annoying and a little risky. For example, a recent statistic claimed that only a quarter of the 3,250 buttons at NY intersections for pedestrians to press for a walk signal actually work. And when pressing the button doesn’t result in a light change, how many of us take a chance and run across the road? Other common hazards include the metal hatches on the street that open to form gaping holes on the pavement so deliveries can be made into basements; scaffolding; delivery trucks; bicycle couriers; film sets trailing wires across the pavements; and gawking tourists. My personal favourite is meeting camels out for a morning constitutional during commuter rush hour around the Rockefeller Plaza. This is a sure sign that the Christmas spectacular at Radio City Music Hall is underway. Despite all these hazards, Manhattan is generally safe to get around and I would never have given up my daily walks when I was a resident. Neither would millions of others living in this vibrant city where drivers licenses are largely unnecessary, thanks to generally great walking access and public transport. No wonder New Yorkers are among the slimmest people in the United States. Plenty of walking and – occasionally – being scared out of an appetite. Nina Arron now lives in Lawrence, Otago and still walks the walk.